Schellnhuber hits the wall of reality: full stop | Watts Up With That? This is about one of the most damning pieces on the European climate movement I’ve read all year. An atmosphere of resignation is truly sweeping through Germany’s climate movement. Flagship media are waking up. In the eyes of one Germany’s leading flagship national dailies, the renowned Frankfurter Allgemenine Zeitung, the attempted green coup led by a small group of elite scientists and a mass of activists has come to grinding halt. “In a nutshell, it would keep making the lives of dissenters miserable until they learned to choose correctly. I think we should stop using the term “scientist” for all reports. Academics is a more general term and would better describe the population. Among the researchers some do empirical research while others do literature reviews. Scientist is just a “loaded word” for a conversation to convey authority to the persons cited. One veggie day a week? Like Catholics and fish Fridays? Keinen Schnitzel mehr zu essen? The FAZ writes that one of the fundamental aims of the WBGU was changing Germany’s constitutional law: climate protection was to become an official state priority and that going green was “as morally imperative as the abolition of slavery“. More importantly, the “transformation to a climate-protective society would have to happen very rapidly“. Dissenters would be marginalized and stigmatized, and so denied real participation. Though highly controversial, the WBGU never backed down from this radical proposal, always insisting that the fate of the planet was in imminent peril, that there could be neither compromise nor delay, and that time was of the essence and the science was unanimous. The WBGU even called it a test for democracy, claiming that if society failed to act, it would show that democracy was no longer capable of functioning in the face of crisis…. You can fool all of the people some of the time, at least up until the point that they realise they are being hit in the pocket. It is still only a criticism of the tactics, it is not questioning the orthodoxy of Warmingology. One journalist once summarized: The WBGU is in favor of democracy, but only so long as the people make the right decisions. Translation: Either you agree with us or you are wrong. And since you are wrong, your viewpoint is not worth anything and thus should be ignored or actively silenced. Why are those who preach tolerance the most intolerant of all? Hopefully arrests will follow, and there will be a global round-up of climate miscreants and scammers. Thank you, Dr. Nick !! My perspective from the US is that the equivalent of the WGBU here is already employed in the EPA and White House. And evidence shows that they don’t care what our Constitution says. I think the road to the ‘seizure of power’ takes a lot of different avenues, anywhere. Some are just more organized that others (depending on how ‘advanced’ a society is). In the land of sausages and beer, “Veggie Day” was that final straw! A sad tale of would be supermen attempting to attain “Guardian” status in a Neo-Platonic Republic, where some pigs are more equal than others. Fascism or just plain old green pork? “Meatless” Fridays; and it’s more than that fish just happen to be there and convenient. There is no prohibition on use of meat ‘byproducts’ though like butter or eggs either. Rather, it’s a ‘penance’ thing. OMG. Each German I have met was such a nice guy, still, they are trying to take over the world third time in a century, in vain &. collective madness. What’s wrong with Germans? Mind you, even if the somewhat ridiculous Beer Hall Putsch was a complete failure, in ten more years they have tricked their way past democracy indeed. The end result is known. Therefore we are not finished yet with this current mob. We want our money back! We want our money back! C’mon everyone, you know the words! But I have to disagree about not being able to trick their way past democracy. It would be more accurate to say they were not able to to trick their way past people with the courage of their convictions to stand up to the tsunami of scam. People that have had Anthony Watt as a leader. Thank you. Did anybody doubt that, climate catastrophe or no,t people would not accept to become poor? As long climate policy was words it was ok, but when you receive your first energy bill that s another story. They will be ‘flushed’ into yet a different racket probably … the greens/the green mindset that is … and take that, as well, to an extrema. You are correct, but maybe this could be just the first step in a two step process. First get the MSM to make the public realise what a huge cost is being paid to get to the “green utopia”. Then when this sinks in, maybe there will be a politician who matters, and who will realise that telling the pubic that the “green utopia” is not necessary, could be a vote winner. 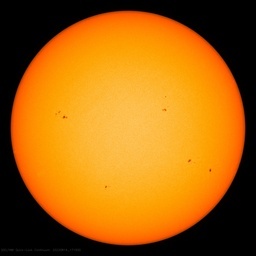 They failed because Solar Cycle 24 did not meet predictions. Can you imagine where the world would be if SC24 had equalled the activity of SC23? Oooops! Another couple of wheels just fell off the CAGW bandwagon. Should be, “no fossil fuel”, day of the week, since it used to be no meat on Fridays, rather than, “fish Fridays”. I think I hear it – yes, offstage somewhere, the fat lady is warming up her pipes. Won’t be long now. Wow!! I thought we defeated National Socialism in WW2? Seem some members of the WGBU have been reading Mien Kampf a little too much! Maybe. The Left never gives up. A setback, perhaps, but nothing total. When “electricity rates skyrocket”, we may see a similar setback on this side of the pond. Freedom is not free. Eternal vigilance required. Note WUWT’s trolls are absent from this type of thread. The malaise, grief and depression isn’t just in Germany. Germany was just the first to get it. They seem to have fewer useful idiots than elsewhere. They began re-development of coal fired electrical generation and abandonment of green econocide ahead of the others and they had several MSM desertions long before the rest of the world’s press began to wake up. The UK is next, despite the silliness of burning already sequestered carbon in the form of hardwood forests of North Carolina – even a green idjit knows that regeneration of forests is a lot slower than burning them and therefore it’s pretty much like burning coal in a time you are trying to reduce carbon (carbon and worse is generated in greater amount from less efficient wood than from coal – even not counting the carbon generation from cutting, handling, pelletizing, multimodal shipping and rehandling of the wood at the other end). Aren’t these forests also habitat being destroyed? The US! What can I say? Obama’s admin seems to be pushing forward with the greatest of zeal at a time when the rest of the industrialized world is trying to figure out how to throw in the towel gracefully. Their “wailing and gnashing of teeth” is yet to come. Harper in Canada has persevered despite heavy fire from the EU, UN and the country’s uncommonly large contingent of useful idiots. Japan, too, ever pragmatic like the Germans, abandoned Kyoto, and of course Eastern Europe, who within this generation escaped from their own totalitarian “democracy by-pass” have been bastions of common sense on this new world order stuff. So I hereby give my “Climate Thanks” to Germany, Oz for the instant turnaround that seems to be a catalyst for speeding the end, Canada, Japan and Eastern Europe. Of course, Africans didn’t have the green wool pulled over their eyes at all. They went for it because if idiots want to give them trillions, why not? China and India just went ahead with their development plans and their thanks but, no thanks. They deserve some thanks for being a stumbling block. Penny Robinson Fan Club is right. It is not yet the Final Solution. It is still only criticism of their tactics. It is not questioning of the Catechism of Warmingology. We still have a way to go for the final surrender and cannot relax. However as Churchill said ‘It is perhaps the beginning of the End’. It is perhaps their Stalingrad. After this they have no more victories. If a technically advanced nation like Germany fails at building a green economy what nation has a chance? The lesson to the left of course is that they must have absolute control, and history will repeat itself again. No. The FAZ has published an opinion piece by Frederike Haupt. And the Washington Post has published an opinion piece by Michael Mann. So? I am not convinced Germany has or will see the light anytime soon. There are far too many so called “journalists” who have made their career on the AGW garbage. The AGW “scientists” if you will, would still be toiling away in obscurity if it was not for the usual idiots in the press. TV, newspaper, and other magazines are the real guilty culprits for this mass propaganda movement. They are criminally responsible for perpetrating this hoax. Governments make policy based on this garbage perpetrated by the press and the green industry working hand in hand. And when did any UN policy become the gold standard for any country that have their own so called checks and balances? Any semi-decent journalists should have checked their facts and never did – entire climate change policies decided by a select few made up of mostly “green” groups – any “journalists” or “editor” worth their salts should have flagged those reports as propaganda. Even now WUWT is under assault from the chosen few who specialize in the smear industry while pushing their AGW agenda. Where are the responsible journalists in North America today? (With apologies to Christoph Waltz and Quentin Terantino. Albertalad, i’m sure NA has many capable and responsible journalists that would love to expose the corruption of the UN and the eco movement. The problem is finding MSM whom are interested in publishing such revelations. the question is why? Is there anything the EPA could not classify as a pollutant via an “endangerment finding”? … Wow!! I thought we defeated National Socialism in WW2? National Socialism was just the German brand for fascism. As Benito Mussolini pointed out, the term “corporatism” would be a good replacement for “fascism”. We fought the Germans, Italians, and Japanese in WWII, and not fascism since FDR loved fascism and practiced it as much as he could. Surely you don’t think the USA is a laissez-faire free market economy or anything close to that do you? Fascism is when the State completely controls the business sector via bureaucracy and regulation while allowing faux-ownership so as to give the illusion that ownership (real ownership, i.e. control) remains in private hands. The greens want to control all business to force them to follow their vision of the “way things should be”. Nothing is new here — pressure groups use the State to seek to control that which is not theirs to control. This is not political speech, but an example of “Strine”, or Australian vernacular. Translated it means that the extreme warmists (who in many cases were/are extreme anti-humanists) are still around and active. @ Nick Stokes. The important thing is, it got published. Previously it would not have been published. Things are changing, one day even the BBC might change. Err… FAZ is talking about the Michael Manns of this world. You’re losing. One important facet of a highly functioning democracy and a growing economy is having the Green vote below 10%. Here’s Tarantino’s great bar scene, where the SS officer notices the tell — the wrong 3 fingers are held up when ordering three glasses [Germans use the thumb and next 2 fingers]. Finally Europe is starting to come back to reality. When you take away a man’s sausage he has nothing. Nick, your last name begins with the letter “S”. And the word “stupid” begins with the letter “s”. So? Eric Idle, as Vice-Pope Eric on the Python Panel sketch. Well at least some German MSM journalist has noticed the WBGU’s drivel (Achse Des Guten has noticed it before but they’re independent journos on a blog). Of course this is not the end of German madnesses, but the beginning of the end of the climate madness in Germany. For those who think that Germans are especially mad people; markstoval at 2:38 pm has got it right. Hitler was just a formidable scapegoat; Churchill wanted to destroy Germany anyway to remove competition and save the empire; in which he fortunately failed. You will, BTW, have the pleasure of watching Germany perish in a number of self inflicted catastrophes against which the renewables capital misallocation pales in comparison; but given the allround collapse of Western civilisation, maybe we will even accomplish to fade slower than the competition (looking at you, UK, there, with your 500% indebtedness, public + private sector added together). You got it exactly right, and you mentioned the important part, “The FAZ has published”. Now, the FAZ is nominally conservative, which means social-democrat for you, and they have been as 100% alarmist warmist as it gets in the past. So, you have lost the RINO’s in Germany; i.e. Merkel. You need a bigger scare. Dark Green politics in Germany is losing another major battle. Earlier, the German government decided to phase out nuclear power in favor of ‘evil’, ‘CO2-belching’, ‘planet-wrecking’, coal-fired power plants. The big news is that the German MSM is having a smell-the-coffee moment. And the editors at FAZ, at least, are PO’d. I hope that the captive media outlets in the USA have similar epiphanies. For independent thinkers here’s the take-away: When the Authoritarian rhetoric gets really shrill, you can bet that the political rascals are lying through their teeth, and that their true agendas are not particularly noble. We saw it with the Big Lie about WMD in Iraq. And we’re seeing it again in the Global War on the Flying Carbon Monster (GWOFCM). In contrast, real problems are usually downplayed. Nothing to see here, folks. Move along. Example from the late 1930s: Neville “Peace in Our Time” Chamberlain. Where are the responsible journalists in North America? I don’t know. If North American journalists originally thought they were going to lose their jobs if they wrote a proper expose of the green take over they may be having second thoughts about that now. A sea change is in the wind. I think they should be fired for not reporting on it in the first place and I have every intention of pressing the issue with editors whenever the opportunity arises. I think we will see some break ranks soon as the exposure of the lies becomes more main stream, and the real climate trend becomes patently obvious to the most casual observer. However, the pervasive “climate change” hand wave when reporting about practically everything from purple losestrife to malaria must be challenged from the peanut gallery at every opportunity. I personally have made a point to throw back everything via email to the local news paper every time something is published that repeats the climatism dogma. It doesn’t matter that what I have said is not published, they know that people are watching and know the truth is following them. WUWT is invaluable in this effort as there are so many well thought out and referenced articles, it makes this effort so much more powerful. Our journalists in North America have not served The People in the capacity that Freedom of the Press was intended to provide. While,to be fair, there have been some who tried to join the battle but they were pushed aside. I don’t know enough about Canada to make a remark but I do know there are some who regard the rough and tumble freedoms in the US with some degree of envy. The affairs of the US Republic may seem messy and head banging but I do believe that it is still capable of functioning even when some elements of our freedom guarantees have failed. The green take over will be stopped in time and as others have stated here, there will be something else to take its place. The eternal vigil must be kept. Vegetarianism is a wolf in sheep’s clothing in as much as it purports to be civil and compassionate but in fact is anti-human in that the intent is to deny humanity meat as a source of valuable nutrition. Climatism and vegetarinism are related: they are bats coming from the same belfry. That would be the “fix humanity guild” of which we have seen way to much. Indeed, that is the wurst. Well, the facts and the truth is winning, and we support that. Were they ever really such a threat to democracy, liberty and everything? Surely the point of this kind of pressure group is (a) to get noticed (b) to get taken seriously by the powers that be, and last but by no means least (c) to get public funding. Actually achieving your stated aims is secondary and sometimes not even desirable. It leaves you with nothing to do, as the cause gets taken over by real professional power maniacs. It’s always puzzled me that often, the climate lobby acts as if it doesn’t understand this – they seem to think that they will actually be allowed to be in charge, just because they are such nice people and have everyone’s best interests at heart. Gary–Global Warming is ALL political. There’s so little “science” in it, I don’t see why they even bother paying $Billions to destroy the credibility and reputations of all those sychophant “climate scientists”. Absolutely. Scientists study the physical and natural world through observation and experimentation. They propose falsifiable hypotheses and test them using empirical data. Climate models aren’t data, and climate modelers are NOT scientists. Far too many frauds don the mantle of ‘scientist’ and masquerade as climatologists. James Lovelock knows of what he speaks: personal experience allows him to say that a lot of humans aren’t that bright. But Lovelock forgets that while there are many—half!—who are below average on the IQ scale, it takes an academic to say something really stupid. I just ran the FAZ article through an automatic translator (because of Deutsch I know not meuch), and agree with others who see FAZ continuing to preach planetary salvation, objecting only to special messianic status for the WBGU. Natural-disaster voodoo has been with us since the beginning of history; as long as carbon hysteria serves the orthodox, it will continue. Yeh, I’m holding my breath on it. I give even odds to this being a renaming of failed products, or of discarding failed messianic notions for a new set. I’m not even wagering on the idea that politicians found the science that the climate scientists can’t find. I know that I am late in the game to this thread. The post shows, as we say here in Australia “the thin edge of the wedge”. The failure of Warsaw is also indicative of that. It was always about the money. Not the environment. Expect now for research funds from the US to show a strong natural variability component to Climate Change in future climate models or at least a slow retreat to “we are now, not really as sure as we were”. They will be off the hook. Even for us here in Australia, the Carbon Tax was, in then Treasurer Wayne Swan’s word’s “Landmark economic policy”. Again, about the money. Not the environment. Once we get it past the now decimated Greens, the Carbon Tax will be a forgotten memory. A German with a Master Plan for Europe. What can go wrong? As we say in Sweden Reality exceeds poems…..
“The end of the beginning” ? What facts do you base this on? 3 simple questions that Marxist ideas and policy don’t pass? It’s about international Marxism through global governance climate treaty(UN) and radical change of western society. The Marxists can’t get to power nationally in free elections with some sort of mixed classic liberal and kapitalistic based democracies. So it’s all about instead getting global control trough global governance and getting rid of the classic liberal and kapitalistic democratic playground. +10 Jon – right on target. I have never been able to believe that the Germans believe that warmist shite. Surely, they are too smart? Wake up, Germany! It’s about classic liberal fundamental freedom and choice for the individual and The Marked for capitalism. With UNFCCC, Kyoto, IPCC and Agenda 21 etc is all about taking away our classic liberal “rights”, democracy, and taking away the “Marked”. That’s why they are calling for a radical change of the Western World and global governance. Historically Marxism have had enormous problem to work nationally and do not give the people living under it the same quality of life and long life’s as more classic liberal and kapitalistic driven democracies do. I think the breakdown of USSR and Eastern Europe was due to the “Information Age” and people there increasingly realizing the difference between Marxism economic failure and the rest of Western World economic success. So the Marxist have leaned their lesson and understand that Marxism must be implemented globally at the same time. And at the same time removing classic liberal and kapitalistic politics and solutions globally and nationally. They know that Marxism is not going to work, but thinks that if we all live in the same misery no one is going to notice it? As the green scam dies, the next wave of #IceAge earth alarmism is born again, Stories are already appearing, again with alarmist headlines warning of impending frozen DOOM! These 2 opposing concepts seem to fight each other over and over, one gaining ascendance in the public psyche, to be replaced by the resurgence of the other. Expect these same alarmist pro-ipcc pro cagw scientists, these prophets and priests of the fiery death and apocalypse by #CO2 to come to an epiphany and re-emerge as the new prophets of the icepocalypse. Remember, reasoned discussion does not open the floodgates to billions of dollars in research funding, useless amelioration projects and donations to NGO’s like the WWF. It would be a tragedy of AGW dissapeared for reason of politics, rather than because it was just junk science. Now I come in from a fairly political angle, and I am delighted. IN fact green idols are being toppled everywhere right now. But this does not advance the cause of good science, merely halts bad science in its tracks. We also owe a duty to reclaim Science FOR Science.and wrest it out of the hands of politicians and marketeers of shoddy product. The hype for funding will never cease, too many people will not just jump ship but change sides completely to ensure they get their piece of this newest pie. They are smart but misinformed. The choir of the media here is nearly entirely synchronized; lead by the most expensive (per capita) “public media” (i.e. state media) complex in the world. Currently we are forced to hand over 8 billion Euros a year for the financing of this giant desinformation apparatus; 100 EUR per capita per year, or 130 USD. Furthermore, there is NO debate of basic values, natural rights, the foundations of Western civilisation, so no German I know can even start to debate such concepts. They are not given the foundations; “Big Statism” is the ONLY philosophy they know; NOWHERE in the last election campaign were the words “lower taxes” or “smaller government” ever even muttered! The words “statist” or “statism” do not even exist in the German language! The German word “statist” means extra in a film production. The parties fight over irrelevant non-problems. The real and big problems, of which warmism is only a minor one, are neither recognized nor analyzed. The age of German philosophers is over for good; this territory is not a state, not a nation, not a democracy, and will not bring forth any idea that will help it solve its problems, as the intellectual basis has been erased. BTW, it has been designed this way, by the occupation forces, so thanks for that. The struggle between the true environmentalists and the greens with red inside that is happening in Germany is happening in most countries in the west to some degree .It is like the struggle between the original pollution control agenda and the current desire for people control agenda It is as old as time . Each generation has to fight the battle to some degree. Freedom requires constant vigilance. Glad to see that P. Gosselin is keeping us up to date to what is happening in Europe and Germany. A “choice between global warming or a new ice age”? Re-branding the same idiocy. That was Arrhenius’s dream, that we could, by virtue of our CO2 emissions stave off an ice age. Unfortunately, he was wrong. We humans don’t get to choose our climate (except by moving to a different one); climate chooses us. Never imagined I’d see a website like yours! Yes, Angela Cartwright is still gorgeous & endearing after all these yrs. The episode where she went into a different dimension thru a silvered mirror was haunting & very effective. This is hot. It should be top post for a while. Maybe get noticed by other journalists. Nothing unintended or mixed about it. The seas are caused by the wind. This method is clearly seen in the tactics of the WBGU, but look around. It is the M. O. of people openly seeking power and control over others around the world and at all levels of society. I guess blackmail would be a third way to seize power. Blackmail and brute force are pretty much ‘in your face’ power grabs, but the 5 steps to tyranny involving noble cause corruption are usually unrecognized by the masses. The entire global warming culture is based on these steps, but it is also the driving force behind most successful politicians. Obama is a master at wielding these 5 steps. Bush used it too. The formula has been in play for thousands of years, yet most of us have never heard of it or recognize it when it is implemented. sets on mankind’s genetic code to build better a man kind. Presumably as opposed to profit-liking wise men. Back in 1973, during the Arab oil embargo, areas of the world that had not had open road speed limits suddenly got them based on a mistaken idea that it would help conserve fuel. The great states of Nevada and Montana which did not have absolute speed limits (although Montana had a nighttime 65 mph speed limit) were forced to adopt the national US 55mph limit. I believe Switzerland and Belgium did not have super highway speed limits; well they got a 100 kph limit. France and Italy certainly did not have limits on their autoroutes and autostrada. They got them too. Most importantly, however, Germany got a speed limit on its fabled autobahn. Following that, generally mythical, oil crisis of 1973 all the areas that got speed limits kept them in one form or another. Except for Montana, which returned to ‘reasonable and prudent’ for a couple years from 1996 to 1998. And, most importantly, Germany. Following the crisis the German Ministry of Transport conducted a 3 year study concerning the safety aspects of a speed limit on the autobahn and concluded there was no benefit. And why should there be? Following an ice storm do revised speed limit signs suddenly spring up along the highway, or do motorists adjust their speed accordingly? But I’m getting sidetracked. Anyway, despite the Ministry’s findings the unlimited speed aspect of the autobahn has remained controversial. And it should be no surprise that the Green Party in Germany hates it. The whole impetus behind the environmentalists has always been all about restricting every aspect of human behavior that they can, and private mobility is certainly not the least of it. I don’t know the situation today but it is my understanding that just a few short years ago environmental legislation was introduced to initiate a speed limit on the autobahn and none other than Angela Merkel herself declined to sign it. I believe she stated that she did not wish to be personally responsible for such a change. Germans have always been suckers for authority (my grandmother was from Berlin). But it’s been said that many Germans feel passionately about the unlimited speed autobahn since it’s one of the last vestiges of freedom for a micromanaged people. I don’t know what the moral of the foregoing story is. But I suspect that Nature endowed us with at least some characteristics that do not work in unison. One of which is autonomy which is largely predicated by personal freedom. And another is the quest for power which oftentimes is the antithesis of that autonomy. However, without autonomy life simply cannot continue. (I’ve seen that up close and personal in nursing homes.) So, if all personal freedoms are ultimately relegated to the trash heap, and life is to continue, something will have to snap. Perhaps that motivated Angela Merkel’s decision. And maybe Rahmstorf et al need a lesson. So when does any one start to understand what IS happening. “I don’t know the situation today but it is my understanding that just a few short years ago environmental legislation was introduced to initiate a speed limit on the autobahn and none other than Angela Merkel herself declined to sign it. I believe she stated that she did not wish to be personally responsible for such a change. There is no general speed limit even though 70% or so of Autobahn kilometers have speed limits due to traffic density or landscape issues. The harder left, from SPD and Greens leftwards, are still pressing for the general speed limit; I think they do it to lose elections, as it looks to me if they really wanted to accomplish it they would lie about it, get elected and then break their promises. And: “Do GHGs perhaps just block the path of IR radiation – or do GHGs do what CAGW & AGW scientists “believe” they do? Whatever that may be. Years ago I had hoped to travel to Germany for a chance to drive on the autobahn. I doubt I can anymore but it’s still nice to hear that about 1/3rd of it is still speed limit free. Thank you very much for confirming that. My understanding is that the 85th percentile speed on the autobahn is about 150 kph (90 mph) yet the fatality rate is virtually identical to the US Interstate highway system where 90 mph is a guaranteed very expensive ticket. While I’ll never get to the autobahn I did get a chance to drive through Montana on the way from Chicago to Seattle in 1998. What I’m going to say reminds me of an old Bruce Springsteen song, ‘Glory Days’, where one of the lyrics was, ‘when I get old I hope I don’t sit around talking about it but I probably will.’ Through Montana in ’98 in an Alfa Romeo Milano I covered 782 miles (about 1,275 km) in 9 1/2 hours – with stops. So I guess I sort of got to the autobahn after all. Here in Tasmania, the Greens lobbied for years for plantation forestry so the wilderness forests could be preserved. These days they lobby against plantation forests. Sadly though they are inconsistent. They have not reversed on logging the wilderness. I’d say that was “a threat to democracy, liberty and everything”. The question is not why wouldn’t the news sources be interested in telling the truth, its why would they. Very few mega corps own Newspapers, mags, television. We have a monopoly going for any news or information and they ALL have a stake in the green energy scam. Its not hard to figure out why they are what they are when you follow the money back to the source. Until we can liberate our information sources from the agenda of their parent corporation we have little hope of getting anything but what agenda they choose to pursue. Start locally, hold their feet to the fire (that is an old saying and should not be taken literally), make them accountable and let them know we are sick of it.. when the people stop taking this crap silently, LOCALLY, then we have a lot better chance of stopping it nationally. If you want to do it, use the new Autobahns in the former DDR; they’re flat and straight and 3 lanes and all. Tom Hanks describes it well here. Simple system; leftest lane is the fastest. Everyone has got to drive on the right except when overtaking. So you have speed-sorted traffic. Let’s not get carried away too soon. The Green Master Plan may look a bit shaky, but its hopeful future demise will have more to do with politics and energy costs. The Aussie electorate has shown that green is no longer a vote winner, neither is fuel poverty and possible blackouts here in Europe. My feeling is that this quote more accurately describes the present situation with CAGW. It is not yet even the beginning of the end, but it is perhaps, the end of the Media’s one-sided coverage. Minor nitpick: Half will be below the median score. Please, unless a law is passed demanding everyone be a Catholic, there is no logical comparison. Not to worry, next June the MSM will be shouting the Arctic Ice pack melting fast! Climate Deniers finally acknowledge ice melts when it gets warmer! I think we should stop using the term “scientist” for all reports. Academics is a more general term and would better describe the population. A very sensitve point Loghin, voted from me. Academics much better describes the population. …. The whole impetus behind the environmentalists has always been all about restricting every aspect of human behavior that they can, and private mobility is certainly not the least of it. How very true Tom. They did not manage to set a limit to the speed on the german autobahn yet but they managed to put a limit the power on the future vacuum cleaners in the EU. And the limit is really low, 900 Watt from 2017.